justWink is a free iPhone app for sending postcards. Getting a card is an easy answer to nearly every gift-giving problem, as they come in all shapes and sizes for any situation you can come up with–and probably some you’d never even consider. But what if you’re too tired to go to a store and stare at five huge card racks just to find one? One solution is to download justWink, a free ecard app from American Greetings, one of the world’s largest greeting card companies. Right after the splash page with the truly adorable mascot, there a handful of “featured” cards for you to view; swipe left or right to scroll through them. If one catches your eye, tap on it to enlarge the cover view, and again to see the inside message (tapping it a third time will allow you to see the inside cover, but usually there’s nothing there). For more card options, tap the green arrow on the top header, or pull down on the header for a cooler effect. There, you can see all the categories of special occasions: from birthdays to thank yous to weddings. Once you have chosen a card, you can personalize it with a photo, note, or even a signature (usually I utilize all of the above, just for that super personal touch! ); just tap each area to add the option. The photo can be from your Camera Roll or taken from the device’s camera. Pinch zoom to enlarge or shrink the chosen photo, but in the end, there will be a Polaroid border anyway; you can even rotate the photo by holding and swiveling your fingers. Adding a message is pretty self-explanatory, but adding the signature is a really nice touch (you can change the line widths if you’re a heavy-handed writer). Preview the final product to make sure it’s up to par, and then send it off to the intended recipient through email or Facebook–you need to have an account (making one is free and quick) before you can send, however. As a previous buyer of American Greetings, I was really surprised by some of the content in the cards; it is no wonder they’re ecards, because you wouldn’t find some of these on the rack. 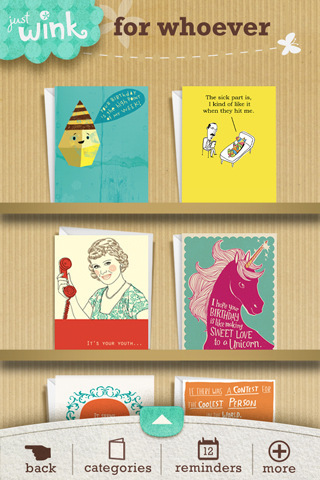 The cards in justWink can be mildly offensive or off-putting, so try not to send it to sensitive people. On the other hand, people with a sense of humor might enjoy sending/receiving these cards. Despite the unexpectedly bold content, there’s no denying that all the cards are very cute: most have simplistic designs in an eye-catching array of color and font. Even the “loading” messages are adorable. I’d like to have more color options for personalizing my cards…maybe I want to sign my name in orange! The biggest problem I had with using this app, though, was the lag. Maybe it’s because justWink is a graphics-intensive app, but I don’t like waiting a minute for the card to unfold and reveal the message inside (from the user reviews in iTunes, it sounds like some people couldn’t even get past the splash page). There has to be a way for the developers to streamline the app. In the future, they do promise a couple of new features that sound useful: a reminders function (because birthdays are hard to remember) and a send-as-text function, although I’d love to see this app integrated with Twitter as well. I hope American Greetings plans to update the content as well as adding new features, because I can only use the same birthday cards so many times. AppSafari review of justWink was written by Julie Guan on July 5th, 2011 and categorized under App Store, Events, Free, Social. Page viewed 3980 times, 1 so far today. Need help on using these apps? Please read the Help Page.